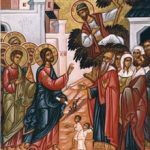 FEB 3: DIVINE LITURGY – 10:00 AM; FEB 5: 6TH HOUR & CATECHISM – 11:00 AM. The season of the Great Fast is preceded by its own liturgical preparation. The first sign of the approach of the Great Fast comes five Sundays before its beginning, during which the faithful prepare themselves for the abstinence, prayer, and repentance. The first of these is the Sunday of Zacchaeus, then the Sunday of the Publican and Pharisee, followed by the Sunday of the Prodigal Son, then the Sunday of the Last Judgment, and then the Sunday of Forgiveness. These last two Sundays are called “Meat-fare” and “Cheese-fare” Sundays, respectively, since the first one marks the end of the eating of meat two weeks before the Great Fast, and the second the end of the consumption of dairy products one week before the Great Fast. 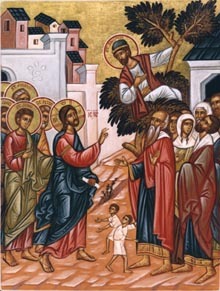 Today’s Gospel Reading is Luke 19: 1-10 in which Jesus Seeks Zacchaeus, the Tax-Collector, for that reason the Sunday is known as “Zacchaeus Sunday.” The account was chosen to open the Lenten season because of 2 reasons: Jesus’ call to Zacchaeus to come down from the tree (symbolizing the divine call to humility) and Zacchaeus’ subsequent repentance. It tells how Christ brought salvation to the sinful man, and how his life was changed simply because he “sought to see who Jesus was” (Luke 19:3). Our Lenten journey begins with a recognition of our own sinfulness, just as Zacchaeus recognized his. He promised to make restitution by giving half of his wealth to the poor, and by paying to those he had falsely accused four times as much as they had lost. In this, he went beyond the requirements of the Law. We are also assured of God’s mercy and compassion by Christ’s words to Zacchaeus, “Today salvation is come to this house” (Luke 19:9).